Japan came out of recession in the fourth quarter of last year, but the world's third largest economy grew at a slower than expected pace. Japan's growth in the fourth quarter comes after the economy contracted for the two previous quarters. Glenn Levine, senior economist at Moody's Analytics said exports "added solidly" to economic growth, accounting for about half of the expansion, while the rest of the economy remained relatively subdued. Is Japan's economy back to growth? As Aristotle is reputed to have said: "One swallow does not a summer make, nor one fine day", so one quarter of positive GDP growth does not make a trend. Nearly two years after "Abenomics" what has really changed? Vast amounts of money have been shovelled in to the Japanese economy. That has had two big impacts. It has pushed up real estate and stock prices, and it has pushed down the value of the yen. The first has made rich Japanese richer; the second has made big Japanese exporters richer. But there it has stopped. There has been virtually no trickle-down to the rest of Japan. Stagnant wages and rising prices through most of last year mean most Japanese actually feel poorer. One sign of hope is that unemployment has fallen to just 3.5%. A tightening labour market could finally force Japan's corporations to start parting with some of their vast cash piles in the shape of real wage increases - but don't hold your breath. The most disappointing component of the gross domestic product (GDP) figures was the "paltry" increase in business investment. "Japan's corporate sector is enjoying record profit levels and sits atop a mountain of cash, with export-facing firms, in particular, benefiting from better export sales linked to the cheaper yen," Mr Levine of Moody's said. "Yet, so far firms have been reluctant to deploy any of this cash and invest in additional capacity." This "issue of confidence" shows that firms do not believe that the domestic economy is improving, which is a reflection of whether Prime Minister Abe's economic policies termed "Abenomics" are succeeding, he said. 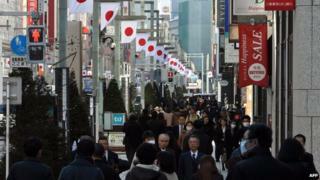 Japan's weaker than expected growth comes despite a series of stimulus measures by the government. In December, the government approved a $29bn (£18.8bn) stimulus package to help businesses and consumers just two weeks after a victory by the prime minister in a snap election. Markets, however, reacted positively to the growth figures with the benchmark Nikkei 225 hitting a nearly eight-year high of 18,047.07 in early trade, marking its highest level since July 2007.